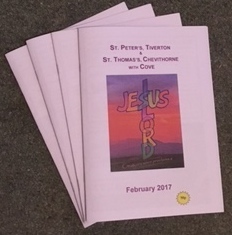 The Parish Magazine is published monthly at a price of 50p and copies can be found just inside the Church door at St Peter’s. It features articles about both St Peter’s and St Thomas’s. Any material for inclusion in a future magazine should be submitted by the 10th of the previous month to TheParishMagazine@live.com. Any business wishing to advertise in the Magazine should contact Ivor Atkins at 11 Churchill Road, Tiverton, Devon EX16 5AN.